When it comes to Custom Gas Fireplaces, there are many options to consider. Starting with the flame itself. You’ll want a tall, safe and beautiful flame, right? 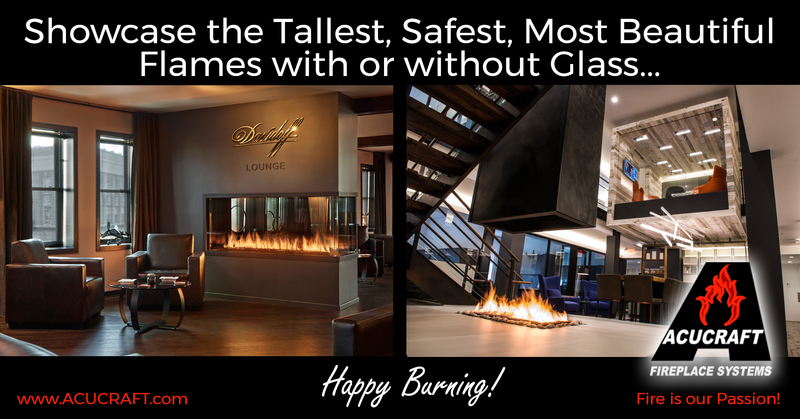 Acucraft Produces the Tallest and Safest Flames on the Market—Guaranteed! Acucraft design engineers have created a custom burner and tray design that produces the tallest, fullest, safest, most beautiful gas flames on the market—guaranteed! Your safety is our priority! All Acucraft gas fireplaces are factory tested to meet or exceed performance and safety standards before they are crated and delivered to your job site. For added safety assurance and peace of mind, Acucraft became the first fireplace manufacturer in the world to conduct internal lab testing that is certified by 3rd-Party LabTest Certification, Inc.. Acucraft performs 3rd-Party Certification from our internal test lab to verify that our indoor gas-burning fireplaces meet or exceed ANSI Z21.50 / CSA 2.22 standards. Then LabTest Certification, Inc. reviews these performance and safety reports for Label approval. Next, you’ll need to decide how to showcase your flames with glass [or without glass] and with or without a glass cooling technology. Acucraft Custom Gas Peninsula Fireplace with Dual Pane Glass and Acucraft Patent-Pending Glass Cooling System. Acucraft Patent-Pending Glass Cooling System ensures a tall, stable flame with less turbulence and keeps your glass a safe-to-touch temperature. 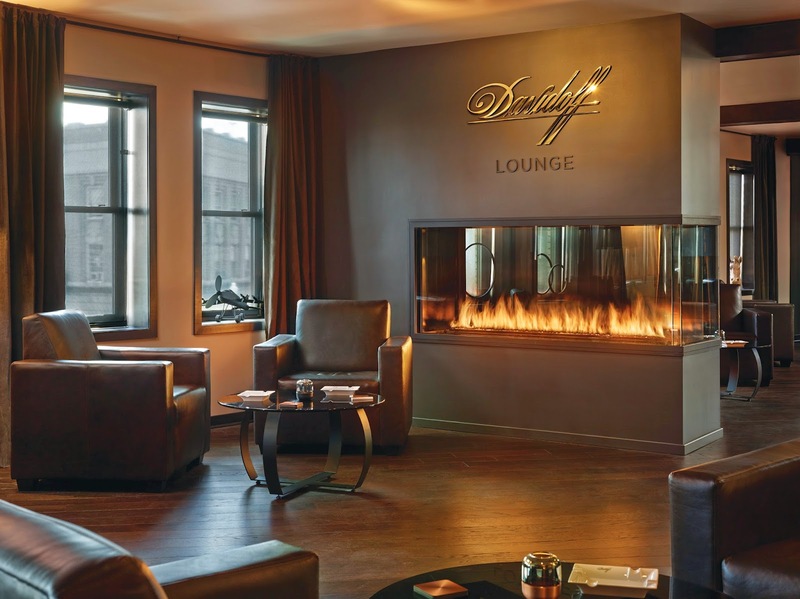 This way you can enjoy the dynamic and luxurious flames worry free as your fireplace charms your space. 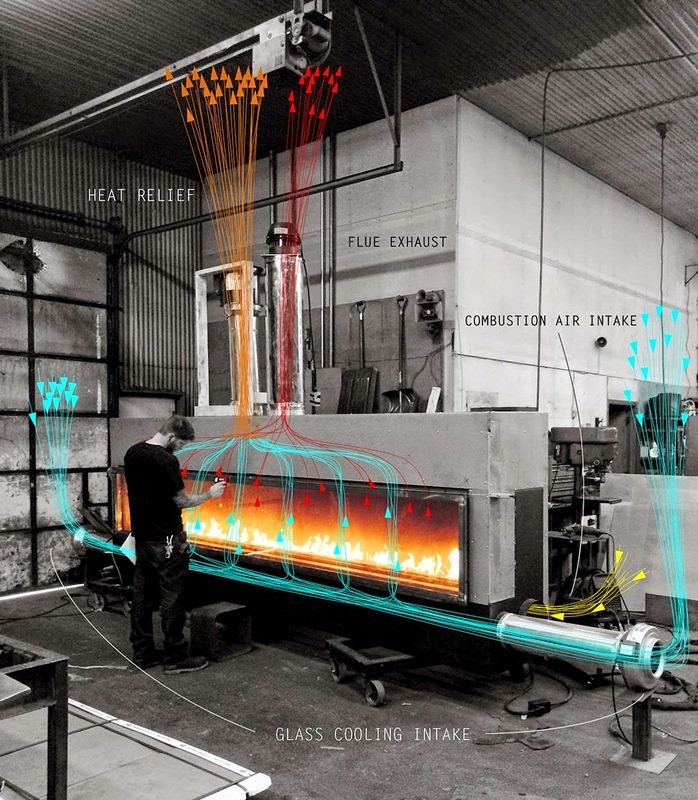 Acucraft’s Patent-Pending Glass Cooling System. The blue arrows represent cool air that is drawn from the outdoors and passes between the dual pane glass. This keeps the glass a safe-to-touch temperature. Warmed fireplace air is either transferred into your space for added heat or vented outdoors (orange arrows). The yellow arrows represent outdoor air drawn into the combustion air intake that flows through the fireplace, heats up, and creates a draft which pushes the vented gas to the outside (red arrows). These two systems work together to maintain a safer, cooler glass temperature, as well as provide you with supplemental heat for your space if you choose. An Acucraft gas fireplace with a single pane glass allows more radiant heat to warm your room. The glass can be hot to the touch—an average glass temperature of 255 degrees F. (Glass temperature may vary based on flame height and size of viewing area.) For additional safety with single pane glass, add a custom firescreen. Acucraft Patented Airshield System is designed to keep the outer pane of glass cool. It is designed to draw cool air from the room through the bottom and expel heated air through the top. This system can reduce glass temperature as much as 100°F while still providing supplemental heat to your room. 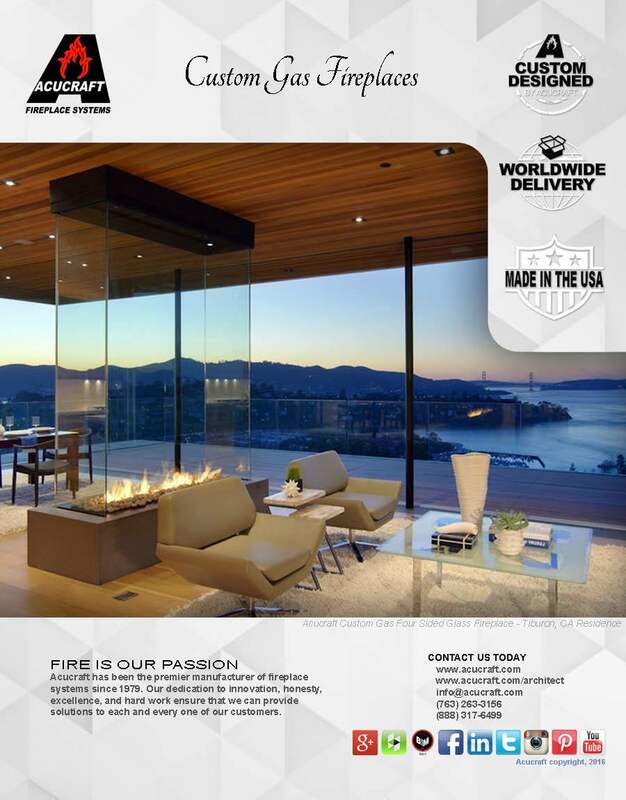 Acucraft also specializes in open flame fireplace systems that offer an intimate flame view without glass glare and the ultimate unobstructed view! Acucraft Custom Indoor Gas Fire Pit with Open Flame and Four-Sided Suspended Glass. Acucraft Custom Gas Peninsula Linear Fireplace with Open Flame and Half Glass acting as a Barrier. 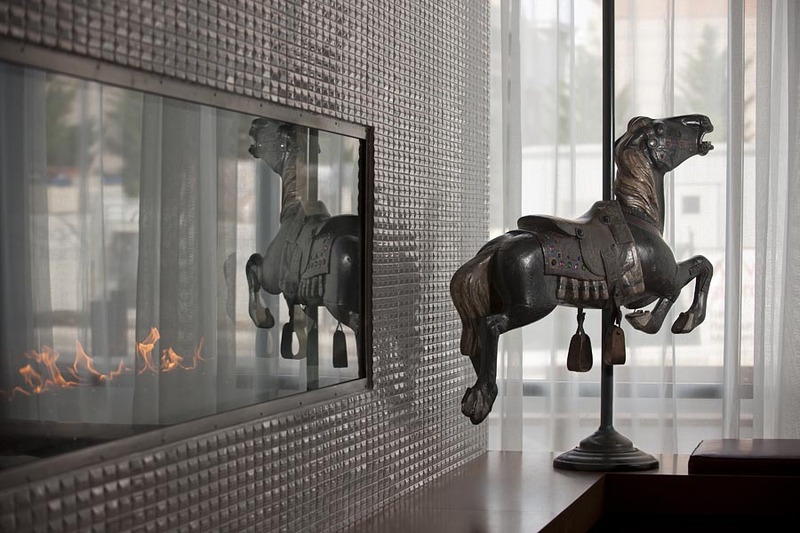 When it comes to Custom Gas Fireplaces, Acucraft rises above the rest. Acucraft is passionate about making your fireplace dreams come true. Whether you’re looking for one-of-a-kind fire feature or just want to add fireplace ambiance to your home, our knowledgeable Fireplace Advisors and Designers will work with you one-on-one to handcraft the perfect fireplace for you to last a lifetime of Happy Burning! Get started today by requesting an Acucraft Custom Gas Brochure!